This unique water resistant starting timer has huge 30 mm digits and a synchronize function in case you missed a signal. Beeps during the last minute every 10 seconds and during the last 10 seconds every second. Sound is on/off switchable. 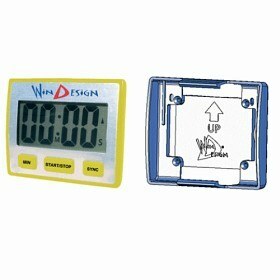 We also developed a universal timer bracket. (See EX3012) You can now fix the timer anywhere you want. Screw the bracket to a flat surface or fix it on a mast or boom with the provided back to back velcro strap. The bracket can also be fixed to an airbag strap of an Optimist dinghy.